Some cat breeds are typically independent and aloof, even if they've been raised by the same person since kittenhood; others bond closely to one person and are indifferent to everyone else; and some shower the whole family with affection. Breed isn't the only factor that goes into affection levels; cats who were raised inside a home with people around feel more comfortable with humans and bond more easily. If you're going to share your home with a cat, you'll need to deal with some level of cat hair on your clothes and in your house. However, shedding does vary among the breeds. If you're a neatnik you'll need to either pick a low-shedding breed, or relax your standards. Due to poor breeding practices, some breeds are prone to certain genetic health problems. This doesn't mean that every cat of that breed will develop those diseases; it just means that they're at an increased risk. If you're looking only for purebred cats or kittens, it's a good idea to find out which genetic illnesses are common to the breed you're interested in. Some cats are perpetual kittens — full of energy and mischief — while others are more serious and sedate. Although a playful kitten sounds endearing, consider how many games of chase the mouse-toy you want to play each day, and whether you have kids or other animals who can stand in as playmates. Some breeds sound off more often than others. When choosing a breed, think about how the cat vocalizes and how often. If constant "conversation" drives you crazy, consider a kitty less likely to chat. Being tolerant of children, sturdy enough to handle the heavy-handed pets and hugs they can dish out, and having a nonchalant attitude toward running, screaming youngsters are all traits that make a kid-friendly cat. Our ratings are generalizations, and they're not a guarantee of how any breed or individual cat will behave; cats from any breed can be good with children based on their past experiences and personality. Stranger-friendly cats will greet guests with a curious glance or a playful approach; others are shy or indifferent, perhaps even hiding under furniture or skedaddling to another room. However, no matter what the breed, a cat who was exposed to lots of different types, ages, sizes, and shapes of people as a kitten will respond better to strangers as an adult. Some breeds require very little in the way of grooming; others require regular brushing to stay clean and healthy. Consider whether you have the time and patience for a cat that needs daily brushing. Some cat breeds are reputed smarter than others. But all cats, if deprived the mental stimulation they need, will make their own busy work. Interactive cat toys are a good way to give a cat a brain workout and keep him out of mischief. Friendliness toward other household animals and friendliness toward humans are two completely different things. Some cats are more likely than others to be accepting of other pets in the home. The Pixie-Bob breed is thought to have started from the unplanned litter of a bobcat and a barn cat in 1985. The barn cat belonged to Carol Ann Brewer, and she named a female kitten Pixie. Pixie became the foundation mother for this breed. While there is no hard proof that Pixie’s father was actually a wildcat, it is widely believed and accepted by breeders. The International Cat Association (TICA) officially recognized the Pixie-Bob as a breed in 1994. It took the American Cat Fanciers Association (ACFA) up until 2005 to follow suit and accept the Pixie-Bob as a recognized breed. Breeders are still hoping that the Cat Fanciers Association (CFA) will soon start accepting the Pixie-Bob as a breed as well. The Pixie-Bob can be quite a large cat! Female Pixie-Bobs tend to weigh in between 8-12 pounds, whereas the male Pixie-Bob can clock in around up to 25 pounds! 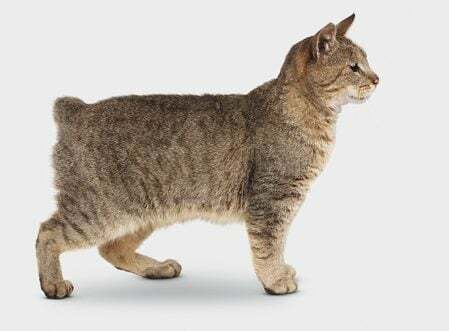 The Pixie-Bob is a brawny, muscular cat, which is why many breeders do believe a Coastal Red Bobcat had to be the founding father of the breed. Pixie-Bobs may have been created out of wild passion, but for the most part, Pixie-Bobs are a mellow sort of cat. Pixie-Bobs love to be with their owners, but Pixie-Bobs are not considered hyperactive by any stretch of the imagination. These cats enjoy laid-back hang sessions with the family and have been described as “dog-like” in personality. Pixie-Bobs bond very strongly with their families and love taking car rides and leashed walks with their loved ones. This is what makes the Pixie-Bob an ideal cat for families with children. Pixie-Bob’s ability to bond with their humans along with their patient personas make them excellent companions for children. Pixie-Bobs as a breed are relatively healthy and not prone to many illnesses. The breed is frequently outcrossed, which helps avoid potential health problems that arise from inbreeding. There are a couple of health issues that still can arise with a Pixie-Bob cat. A small percentage of Pixie-Bobs have difficulty delivering litters and may suffer health consequences. These Pixie-Bobs are taken out of breeding in hopes of reducing this issue. A few cases of Cryptorchidism (missing testes or scrotum) have been reported in Pixie-Bobs, but not enough to consider it a health hazard for Pixie-Bobs across the board. Pixie-Bobs are unique in the fact that they are polydactyl. Polydactyl cats have more than the usual number of digits on its paws. Polydactyl cats are considered lucky, so if you have a Pixie-Bob, luck may be on your side! Pixie-Bobs do not inherently have many health issues, but basic care is a must for these large cats. An issue that can arise with Pixie-Bobs is a little extra weight. Be sure to maintain your Pixie-Bob’s weight at a healthy point and not mistake it for him simply being a large cat. Pixie-Bobs have a thick double coat which needs to be brushed regularly to avoid matting and excessive shedding. The texture is “wooly,” like a bobcat, and can be either short-haired or long-haired. Typically, Pixie-Bobs have a mackerel or striped coat pattern. Sometimes these stripes are accompanied by rosettes, giving the Pixie-Bob that authentic bobcat look. A Pixie-Bob’s coat can be a variety of colors, but are mostly tawny, light gray, or reddish in appearance. Given the Pixie-Bob’s dog-like reputation, these cats make excellent companions for homes with other pets and with children. The Pixie-Bob’s devotion to its family and overall loyalty make them excellent companions for pretty much anyone!